The top has a loose cut, short sleeves with small gathers in the shoulder area and pompom lace at the end of the sleeves and neckline. A loving detail is the decorative stitch around the V-neck as well as a small satin bow. Ruffles in the chest area ensures a nice fit and flatter the figure. It is made of a great organic cotton material. The shorts have a wide elastic waistband with a tie belt and side pockets. It is loosely cut and has a fabric panel at the leg end. The pants are made of a great organic cotton material with elastane content. 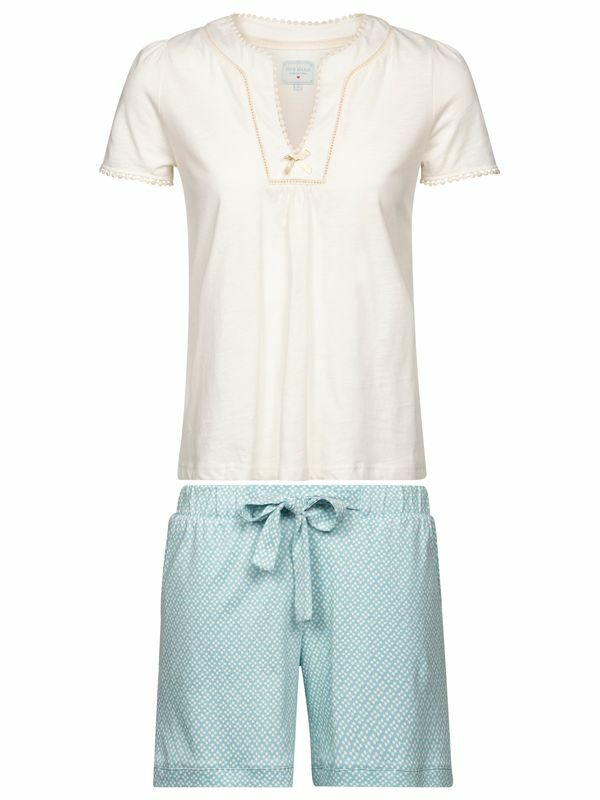 A super cute pyjama for light summer days. One can really imagine having breakfast on the balcony.